Birmingham City Council recently approved plans for a Class D charging Clean Air Zone (CAZ), which would include private cars. Highways spoke to councillor Waseem Zaffar MBE, cabinet member for transport and environment, about the issue at the National Clean Air Summit. After you released your plans, West Midlands mayor Andy Street announced his support. How important do you think his support is likely to be in implementing the proposals, politically and practically? Politically it's absolutely essential that we have got a collaborative approach between the local authority and the West Midlands Combined Authority, chaired by the elected mayor. And obviously, being of two different political parties, it really shows that we are united in addressing the challenges and health inequalities that air pollution creates. We've had some very sensible and mature conversations and Andy has been incredibly supportive of that. Politically it's also absolutely essential for us to utilise Andy Street’s vast network within government and his interventions at times have been very, very helpful so we really appreciate that. In terms of delivering the Clean Air Zone, one of the key aspects is the modal shift and public transport is at the core of that, alongside cycling and walking. So to be able to work alongside Andy Street to ensure that we make vast improvements to public transport across the city and across the region will be absolutely instrumental in making sure that we tackle the challenges around air pollution and introducing a Clean Air Zone within our middle ring road. So Andy's interventions have been very mature, very collaborative and really, really helpful. 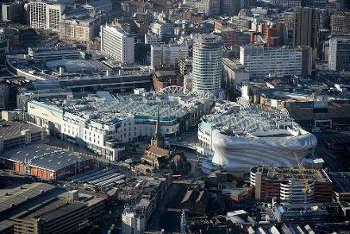 Do you think that on a political front you will have difficulty taking the public, the residents of Birmingham, with you on this? We got to win the hearts and minds of our residents and what I always say about any change however small or large – and in this case it is quite substantial change – is that we have to do things with the city and not to the city. I think the initial comments that we’ve had back and the monitoring we are doing on social media activity and the various opinions coming forward have been positive, I wouldn’t say very positive but I would say positive and helpful. We’re looking to use the consultation period for people to come forward and to challenge us, to support us, to criticise us, to be a critical friend, but also to come forward with radical ideas about how we can make this happen; how we can ensure that cultural shift can take place within our communities. I don’t think there is anybody out there who can argue with the fact that we got to do something to tackle air pollution. Nine hundred premature deaths in our city is 900 deaths too many and together as decision makers, politicians and as a city, I think we need to come together to create a historical moment where we stand united against air pollution and illegal levels of air pollution within our city. We have to do that because that is the least we owe our future generations, who will never forgive us if we do not make these fundamental changes. It looks as if the charge is going to be set at the higher rate of at least £12.50. Is that right? No, we’ve not decided on the rates at the moment. We are using those figures from other cities just as a sort of guide to residents. The last thing we want to do is get people being consulted on something they don’t know what they’re being consulted on and the reason I’ve got a wry smile on my face is that I don’t think when the people were voting in the EU referendum they knew exactly what they were voting for. So while we’re not absolutely accurate it will be within that particular range and ultimately the fundamental decision around this will be made following the consultation and in our submission to government in September. I understand from the report even with a class D CAZ quite a lot more still needs to be done to achieve compliance. Our modelling has clearly said that if we were to introduce a Class D within the middle ring road we still wouldn’t reach the required air quality levels expected by government and the EU by 2020 so we’ve got to look at some other fundamental improvements. For me CAZ is an important but small element to the wider air quality strategy work that we’ve got to do. The radical piece of work that we’ve got to do is in terms of cultural shift and modal shift and everything else that is to come about with it. We want to create a clean air city. We want to create a city where everyone has their fundamental right of breathing good quality air, irrespective of where they live in the city and in particular we want to look at how air pollution impacts around school communities, because there are some massive challenges around school communities. This morning we were listening to young children talking about how important this is because of the impact that air pollution can have at that early age when they are still growing in terms of size. What do you think about the Government requiring councils to demonstrate that other methods won’t be equally effective before bringing in a charging CAZ? The dynamics of Birmingham are such that it is incredibly difficult to make the dents to air pollution to get to a legal level but also fundamentally the right level for health purposes. We’ve got an incredible busy transport network, we’ve got a motorway running right through our city and we’ve historically not had any form of barrier for people travelling through the city. Pedestrianisation is not at the level that it is in other places, so we’ve got a number of challenges and we’ve looked at various ways of overcoming those particular challenges and CAZ D is obviously the strongest level of Clean Air Zone. While we would have liked to have had an easier way of resolving this unfortunately the reality of the challenge is we don’t think we will be able to do that. But again if people come forward with a new radical idea that will work instead of a Clean Air Zone I’m happy to be pleasantly surprised. Are you confident that you have the technical means of a solution to deliver the CAZ when you bring it in? We are, and conferences such as today will play a big role in that because of the networking opportunities and learning from other small and large authorities; learning from national and international organisations will be absolutely essential in helping us not just with the introduction of the CAZ but the other interventions we want to bring in and the other cultural and modal shift that we want to bring in to tackle air pollution in our city.